Is the US Giving Myanmar a Free Pass? Washington’s excitement at Myanmar’s opening to the West may have been premature, but the Obama administration appears to have deemed the country’s tentative democratization “good enough” to fit the overall U.S. strategy in Asia. That is, Washington hopes to coax potential partners in China’s orbit toward democracy, free trade, and Western values, in order to preserve the status quo balance of power in Asia. Amidst Myanmar’s democratic birthing pains, the U.S. government has sought to provide succor to the country’s reform-minded leaders, while seeking to dispel criticism, which distracts from its overall strategy. As Myanmar prepares for nationwide elections, scheduled for November 8, U.S. officials see the country as a potential democratic partner in the region, hinting at further military cooperation down the road, and hoping to expand trade, education, and cultural ties, as well. Drawing Myanmar out of China’s sphere of influence was touted in Washington as a great diplomatic boon for the U.S. pivot to Asia. Despite the quasi-civilianization of Myanmar’s government since 2011, the rollout of progressive laws liberalizing the economy and relaxing controls on civil society, free media, and the right to assembly, accompanied by upheaval in the social fabric, the country still faces familiar problems from its pre-democratic era. Myanmar’s dramatic reforms notwithstanding, the democratic transition is experiencing setbacks on many fronts. This is especially troubling in an election season, as campaigning has unleashed nationalist forces that could disrupt the fragile peace. The midnight ouster by security forces of the ruling Union Solidarity & Development Party (USDP) Chairman “Thura” Shwe Mann in August; a draft ceasefire agreement signed this month, but without the most powerful insurgent groups; and the continued repression of Rohingya Muslims detained in squalid camps, are all worrying signs of political stagnation. Organized Buddhist organizations, such as Ma Ba Tha, continue to proselytize anti-Muslim hate speech and legislation that would severely curtail the rights and safety of Myanmar’s Muslims. The strongest political parties are loathe to take a stand on the issue for fear of alienating voters among the two-thirds of the national population that are ethnic “Bamar.” For the time being, it seems clear, nothing will be done to alleviate the dire situation until after elections take place in November. Thailand had long been a bedrock of stability in the region. Despite numerous military coups throughout its history, the country remained a reliable democratic and market-oriented partner in the Indo-Pacific. Thailand, a treaty ally of the United States, will likely not return China’s close embrace in the long-term for fear of overreliance. Nor will the Thai government permanently turn away from the West, whose liberal economic policies and educational institutions it has adopted with great success. Thailand remains a hub for Western investment as well as tourism. Therefore, the U.S. may believe it can afford to criticize Thailand’s political crisis. Since the May 2014 coup in Bangkok, Washington has slashed military aid by $4.7 million, reduced the scope of its annual Cobra Gold exercises to less than half of 2013 levels, and condemned the Thai junta’s grip on power in numerous statements. Alongside Thailand’s return to military rule, Myanmar’s democratic lapse should pose concerns for optimistic State Department projections on Southeast Asia’s spreading democratization. Yet Obama’s policy team has touted Myanmar as a shining exemplar of his administration’s democratic idealism. To some, the country’s reforms showed what a policy of outreach and conciliation could archive with even the most hardline of pariah states. Hillary Clinton devoted an entire chapter to the country in her memoir Hard Choices. The United States has limited strategic interests in Myanmar, chief among them security, with democracy and free trade as secondary concerns. The U.S. aims to inhibit China’s expanding regional influence in order to preserve the status quo security architecture put in place by the U.S. and Europe in the aftermath of World War II. The security priority helps explain why the United States has refrained from criticizing Myanmar’s shortcomings in light of President Thein Sein’s efforts to push further democratic reforms. The U.S. needs a “good enough” democratic partner in Myanmar to provide a bulwark on China’s strategic southern border with India. The lack of vital U.S. interests in Myanmar means Washington has invested less in ensuring its democratic success, while nonetheless applauding the nation’s progress. This is unfortunate, because American values do not always align with its interests, as they do in the case of Myanmar. U.S. leaders should throw their full weight behind a coherent Asia policy and seek to balance Congress’s pessimism on Myanmar with the White House’s overly rosy picture of the country. Leaders like Jimmy Carter have traveled to the country extensively to support peaceful and credible elections. Trips like this earn the U.S. legitimacy and a positive image. Civil society groups, like the Carter Center and the National Democratic Institute, can leverage these advantages to encourage Myanmar’s leaders stick to the democratic transition in times to duress. Myanmar’s leaders look to the United States with respect yet with mixed feelings regarding its expectations of a swift and total change. U.S. Asia policymakers need to exercise strategic foresight and show some patience with Myanmar. That doesn’t mean withholding criticism. The U.S. should seek greater engagement to strengthen ties with Myanmar’s leaders and to cultivate cooperation from within its government. It would be remiss to dismiss the genuine reformers who struggle with bureaucratic inertia and endemic corruption. They deserve strong encouragement and support. The U.S. can signal approval while still pointing out areas for improvement and vocalizing disapproval of certain policies, such as genuine efforts to assuage religious and ethnic repression. November’s elections are a major chapter marker in Myanmar’s democratization. The United States must be ready to help where it can and when asked. The U.S. should indiscriminately provide technical support to political parties competing in upcoming national elections. It can work with Myanmar civil society groups to conduct voter education, political party training, and election monitoring. Myanmar’s increasingly independent – yet still constrained – media has a critical role to play in this phase. Freedom of assembly and expression, both dearly defended rights in the United States, are essential to the conduct of free and fair elections. International media organizations, such as Reporters Without Borders, can help by providing capacity building exercises to local journalists and newspapers in terms of election coverage and media strategy. 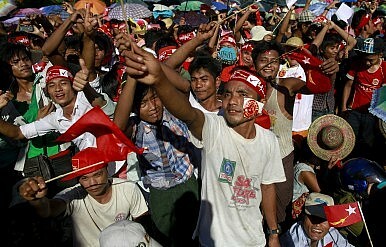 Myanmar’s leaders have opened the floodgates to a range of voices, domestically and internationally. Domestically, Myanmar has a torrent of nationalist, religious, and ethnic, tensions to quell in order to pave the way for a stable and peaceful democracy. Many international observers are criticizing the Thein Sein administration for not moving quickly enough with political reforms. Others are more supportive of the substantial progress made thus far. Washington has sent a bevy of mixed signals, one part congratulating the USDP for its efforts, another part plainly conveying its support for the NLD party, and still other parts chiding all parties for intransigence. In the long run, Washington will gain a more reliable friend and more resilient democratic partner in Myanmar if it speaks openly and with conviction based on America’s respect for human rights and an understanding of the complexities confronting Myanmar’s leadership. Assuming November’s elections are deemed reasonably legitimate, it will be essential for Washington to work with the next administration to continue its supporting role alongside Myanmar’s democratizers, whichever side they be on. Hunter Marston is a Washington, D.C.-based political analyst, who focuses on Southeast Asia. He has worked in international development organizations and the U.S. Embassy in Myanmar. Many of Myanmar's ethnic minorities are growing increasingly disillusioned with America and may turn to China instead.